Sometimes I think God has a wicked sense of humor. It’s as if He (She/It/as you believe) is just waiting for us to start believing our own BS before He takes it upon His Most Holy Self to knock us down off of our own self-built pedestals. Cut to two weeks later, where I found myself on a date with a guy who was later found not only to be NOT divorced, but not really so very completely separated from his wife, either. Everyone who knows me well (or who has read this blog for more than five or six posts) knows I am a bit of a germaphobe. Not the kind of germaphobe where you could feel comfortable eating off any surface in my house. No, that would assume one could find an uncluttered surface to eat off of. I’m the hand sanitizer, handrail-avoiding, holding-my-breath-while-around-sick-people kind of germaphobe. The germaphobe who is imagining every moment of her descent into cold and flu when she is stuck near someone who is visibly or audibly sick. But it is a PHOBIA, not something rational. I am as able to stop it as people with a fear of heights are able to stop from feeling spinny when they stand near a ledge. I remember flying to Hawaii with a kid coughing behind me, all the while calculating if I would have time to enjoy any vacation before I caught whatever he had. I figured that, if I were lucky, I’d be just in time to infect everyone on the flight home if my math about the incubation period was correct. That was not a happy flight. Never mind that for every 100 times I imagine getting sick, I might get a cold once or twice. And yet I persist. God gives me plenty of situations to indulge my rich fantasy life, too. If someone is coughing and sneezing in a theater, I am ALWAYS sitting in front of them. The ONE time I sat in the front row of church was the day the pastor announced she had a cold. The other day at the swimming pool, a woman walked past me as I was getting out, turned her head and coughed RIGHT in my face. In winter, I don’t go to church much, since so many people come to church sick and it is just misery for me to be trapped there, hardly the spiritual experience I’m seeking. Today was one of the days I didn’t go. I had other reasons, too, but the germ thing definitely factored in to my decision. I went to rehearsal, in a small room at the church, with about seven other people. The woman directly to my right was – you guessed it – in the middle of a full-blown cold. And not only did she have a cold, but she didn’t cover her mouth when she coughed. No, she just let it fly. Photo by Vegard Haugland. Used under a Creative Commons license. This is not the lady from church. 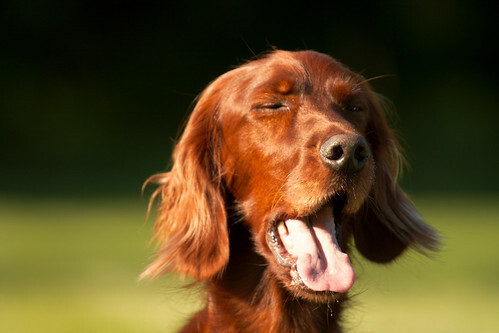 It is a cute dog sneezing. But dog photos make everything better, no? Occasionally she would give some nod toward sanitation, like when she would hold her tiny fist about six inches in front of her mouth, and then cough. My favorite was when she would cover her mouth briefly, remove her hand, and THEN cough. AS IF TO TAUNT ME. She’s a dear lady. We have had many nice conversations on other occasions. And I’m sure she felt she was being dutiful and not letting the Christmas show team down by missing rehearsal. But as a germaphobe, I can’t help but seeing people who are coughing all over turn into Josef Stalin before my eyes. They just transform, like one of those 3-D truckstop postcards that flips back and forth between Elvis and Jesus, except this time it was Nice Lady – Stalin. Nice Lady – Stalin. Blink blink. Blink blink. I got to spend an hour trapped with Stalin the Sicky the Perfectly Nice Lady and my fellow sound effects folks in that tiny room. When it was over, I was ready to flee as soon as possible. But no, God, that special fellow, had ONE more joke left in his bag. Because this is a church production, we had to end our meeting with prayer. Holding hands. With the people on either side of us. Thank you, God. You outdid yourself today. I wonder how many sick days I have saved up? As usual… So caustically brilliant! Tomorrow I’m getting a flu shot. I’m sort of wishy washy on flu shots. But last week my boss, who seems to have a lot of the same reactions as you, begged me to get one. So I’m going to do my best to get in there tomorrow and get it done and hope it doesn’t make me sick just in time for my show! I keep a hand sanitizer clipped to the handl of my purse for just this reason. You need more Depeche Mode in your life. They have it all figured out. Situations like this are opportunities for me, as a gentleman, to offer my clean handkerchief to a lady. It need not come off passive aggressive. Also Suebob, thou rockst it these days.